This paper examines the role of country-specific sources of output and interest rate volatility in driving FDI activities. Building on a dataset that comprises bilateral FDI flows among 24 OECD economies over the period 1985-2007, we find that output and interest rate volatility mainly act as push factors, i.e. they are more effective in deterring rather than encouraging foreign investments. A rise in host country volatilities does reduce the amount of FDI outflows in the recipient country, even after controlling for the state of the cycle. 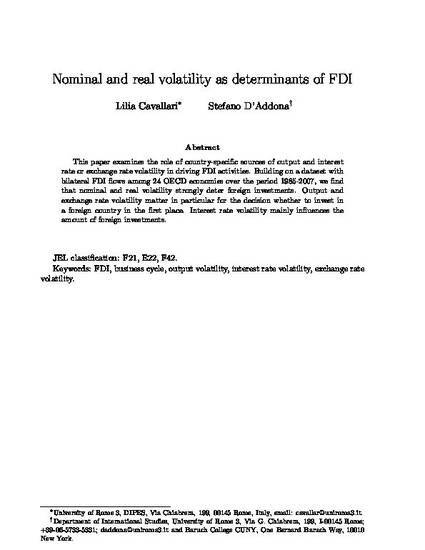 Source country volatilities, on the contrary, do not have a systematic effect on foreign investments. Moreover, our findings reveal that the responses of FDI are asymmetric along the cycle: interest rate volatility reduces FDI flows more in booms than in recessions while the opposite is true for output volatility in the host country. We argue that the evidence provided in this paper is compatible with the view that foreign investments are to some extent irreversible.